When Penn State joined the Big Ten, the George Perles tried to create a Land Grant Trophy rivalry game between Penn State and Michigan State. The game would be played at the end of the year, and usually it would be played in the time slot immediately following The Game of the season, Michigan-Ohio State. There were a couple problems with the game, though. Namely, Penn State usually won, and there was no geographic tie to link the teams together. So, after the Big Ten added Maryland and Rutgers (in part to gain access to the New York and DC television markets, and in part to insulate Penn State to ensure the team didn’t defect to the ACC), the Maryland game has been placed at the end of the schedule to create another rivalry. At least this time, there is geographic logic to the game. Maybe they could create a Mason-Dixon Trophy. However, despite of the one time Maryland got motivated in its first season in the Big Ten (non-handshake game), Penn State has simply smashed the Terrapins, by a combined score of 192-70. The Nittany Lions needed to hold serve to keep their New Year’s Six Bowl hopes alive, against a team that gave [all-of-a-sudden great] Ohio State all they could handle (and very nearly more). In the end, the defense played outstandingly again and defeated an over-achieving Maryland team 38-3. 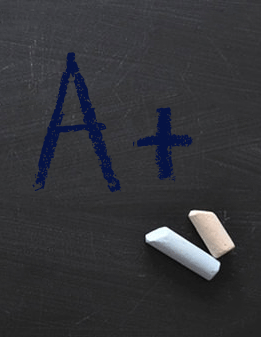 Below are PSU Zone’s grades for the Lions dominant regular season finale. 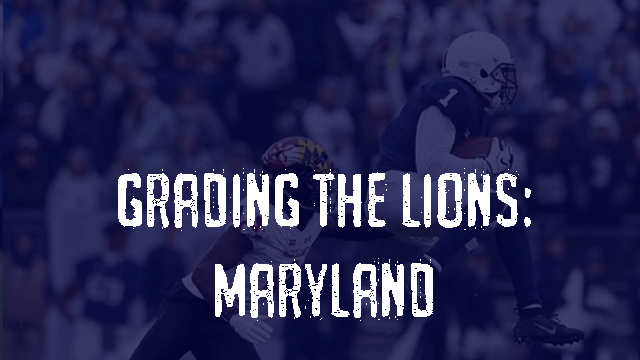 Although the defense replaced the majority of its starters from 2017, we predicted the Nittany Lions would beat Maryland 49-6. This was due in part to an offense thought to be explosive and in part to the mess in which the Terps started their season. To his credit, Maryland HC Matt Canada salvaged a respectable year, the highlight being a week 1 win against Texas. RB Anthony McFarland lit up Ohio State for nearly 300 yards a week ago, but the Lions’ defense totally shut him down. McFarland had 12 yards on the day, good for third on his team. 5 sacks as part of 14.5 tackles for loss made life miserable for Maryland QB Tyrrell Pigrome, who finished with a QBR of under 32. The defense just would not allow Maryland to do anything, setting the tone for a happy sendoff for the seniors. Givens turned in 4 solo tackles, including 2 sacks, leading a defensive line should be credited with a stifling performance. The best part of the day for the front seven: only one senior was announced on Senior Day (LB Koa Farmer), whose backup is freshman Micah Parsons. Not a lot to mention on an uneventful day for the special teams, with only 1 opportunity at a return. With sloppy conditions due to all the rain, K Jake PInegar was perfect again, hitting his only field goal attempt and going 5-5 on extra points. Field position was not all that important, as it felt like Maryland could start a drive at the Penn State 10 and not score. Jake’s field goal stretched the lead to 17-3 on a day when asking the Terrapin offense to score 2 full touchdowns felt like 20. WE knew this team would only go as far as QB Trace McSorley would take them. He promised his team to leave everything he had on the field, and he delivered in a big way on that promise on his final home game in an historic career. He was responsible for three touchdowns (2 rushing), and owned the game from the outset. The team was very balanced with 255 passing yards and 310 rushing. RB Miles Sanders had 128 rushing yards and RB Ricky Slade found the end zone twice, while McSorley and backup QB Tommy Stevens spread the ball between 8 different receivers, led (again) by KJ Hamler’s 90 yards. It was nice to see WR Juwan Johnson have success on two nice catches late in the game. In his final home game in Beaver Stadium, McSorley showed all the aspects that made him a leader these past 3 seasons. Leadership is an undervalued quality, as is simply winning games. McSorley, as HC James Franklin has said, is not flashy nor breathtakingly talented. 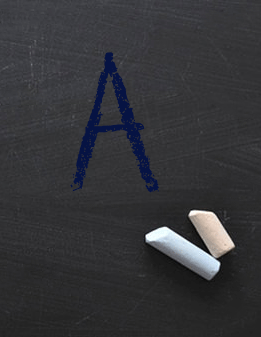 He is, however, consistent, hard-working, and nearly always rises to the challenge – the consummate winner. The team looked like the season could implode after another humiliating loss at Michigan. HC James Franklin is insatiably positive, refusing to let negativity and doubt enter his locker room. Although OC Ricky Rahne’s offense struggled to finish the year, they put out a great game plan and effort (two facets that haven’t always gone together this season) against Maryland, and DC Brent Pry’s defense seems to be really coming into its own, poised for an even better 2019 campaign. 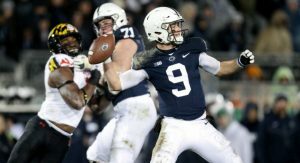 The second half of the season was a struggle for the offense, and despite all his success, some have openly questioned whether McSorley was moving backward. But his performance against Maryland epitomized how he plays: as soon as there is an opportunity to overcome adversity, he instantly does just that, bringing his team with him. To me, the mark of a good coaching staff is what happens when adversity strikes. 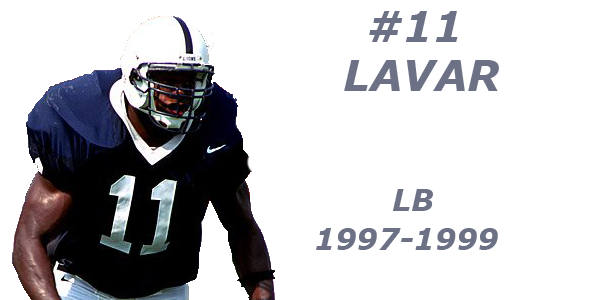 With a roster full of NFL players the past two seasons, Penn State won a conference title and a NY6 bowl. But this year, the mettle of the team was truly tested. It was a young team that grew up over the course of the year, with preseason stars giving way to emergent ones. The team transitioned from an explosive passing offense to a running team and stout defensive club. It will be exciting to see if the team can win a quality bowl game to lead into a promising 2019 season.